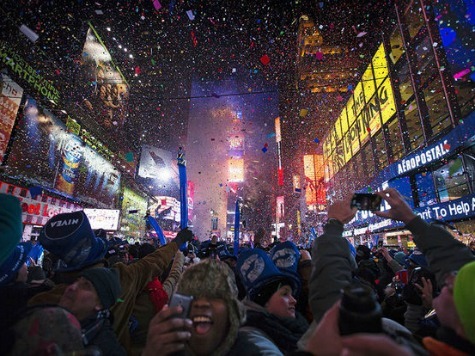 Mere hours before one of the world’s largest New Year’s Eve celebrations, horrified travelers scrambled out of New York’s Port Authority Bus Terminal as men proceeded to attack each other with sharp objects, sending two to the hospital with non-serious injuries. According to the New York Times report, two middle-aged men were injured in their hand and abdomen as a third person accompanying them proceeded to attack them around three hours before midnight. Passersby who merely saw a violent situation without context fled the scene as soon as possible, as police came to assuage the situation. The report notes that hours after the attack, which the Port Authority officials said left “lacerations rather than stabs” on the victims, their blood remained on the Port Authority floor. As no weapon was recovered, it is unclear how they were injured, though CBS reports it was indeed a knife attack. The reason for the attack is also not fully clear, though some reports describe it as a “ticket dispute.” The location is another detail that continues to be murky in conflicting reports. The aforementioned reports claim the fight occurred in the main concourse of the building, while the Daily News reports it actually occurred in the men’s bathroom near that area. Their version includes an interview with a family member of someone who also had a problem with the suspect, a middle-aged man named Jose, who was allegedly slashed in the neck. The suspect, said to be acquainted with the other two, remains at large. The last day of the year also meant a seismic change in executive power for New York City, with former Mayor Michael Bloomberg yielding to current Mayor Bill de Blasio. Bloomberg leaves office with a mixed record on crime. With murders down 20% in 2013, crime has increased in certain extra-urban areas and has left many wondering whether the tactics the police used in Bloomberg’s tenure created pockets of high criminal activity that would have otherwise been spread more evenly throughout the City. Whether de Blasio will continue Bloomberg’s trend is difficult to gauge on Day 1, but he has already left many wondering about his campaign promises against the Terry Stop and Frisk method, as he appointed a supporter of the tactic to run his police department. The measure allows police to stop and ask questions of anyone who looks suspicious.